The Caves of the Aggtelek and Slovak Karst is a transboundary karst cave system, noted for its high concentration of caves and their great variety in cave types. There are 712 caves in total. Features include the world's highest stalagmite and an ice filled abyss. En route from Banska Stiavnica to Kosice I passed the Slovak Karst area, half of this transboundary WHS near the border with Hungary. A number of caves open to visitors are located here, all well signposted off the main road. Some are still closed at this time of year (notably the Dobsinska Ice Cave). I decided to visit the Gombasecka cave, which is applauded in the Bradt guidebook as on of the most visually impressive. I arrived at an almost empty parking area. The ticket booth seemed closed too, but when I appeared the window was opened. The entrance fee is 140SK (about 3 EUR) and you only get in with a guided tour. I had to wait an hour for that (Bradt didn't get the opening hours right). At 1 pm it suddenly got very busy near the entrance. Tens of visitors arrived, mostly regional according to their car plates (Slovak, Czech, Polish, Hungarian). There were so many they even had to split the group in two 'smaller' groups of about 30. The accessible part of this cave isn't very big, the whole tour takes about 40 minutes. Its key feature are the soda straws, very thin and hollow dripstones. It's certainly nice, but not different from other dripstone caves. I had to look hard for an accompanying picture where it doesn't look like that it has been taken at Carlsbad Caverns. But a visit to one of these caves certainly is a nice enough break in the long drive from West to East Slovakia. Slovak and Aggtelek Karst belongs to landscapes that I had opportunity to explore several times, from both undergound and surface aspects. I visited not only 3 caves opened to public on Slovak side, but also explored karstic landscape of Slovak and Hungarian National Parks, mostly western and central parts. Well, it is written in the nomination text that only underground systems are inscribed and noting what is on the surface belongs to WHS, but both "worlds" are interconnected. Thus, one can recognize what is "down" also by picturesque karstic structures such as sinkholes and limestone pavements that are evenly scattered in the landscape of karstic plateaus. I found it also special and worth-visiting. As concerns the structures visible on the surface, I found the karstic landscape of both Slovak and Aggtelek Karst National parks beautiful and quite easy to explore. There are many marked trails in the national parks. However, the area in the close vicinity around famous caves such as Domica, Ochtinska, Baradla or Gombasek is not very special - don´t be confused. One has to climb several hundred meters up to the plateaus such as Plešivská planina Plateau, which is covered by pastures with solitary trees and bushes, and dotted by numerous sinkholes. By the chance we found the "sink" of Zvonivá diera Chasm (photo) with the WHS plaque. The inside of the Chasm is accessible only to spoleologists with special permission. We met one who told us that this Chasm is exceptionaly beautiful inside. Silická planina Plateau is larger but not such picturesque as Plešivská, because several villages are included. There are also special places like Silická ladnica chasm, Bezodná ladnica chasm, etc. I liked the lanscape around village Kečovo with chasms, limestone pavements, etc. On the Hungarian side, the area is maybe not so wild, and it is evident that the buildings and visitors centers are not such abandoned and in decay as it is, sadly, on the Slovak side. In the eastern part of Aggtelek NP, we did a trip to Vecsem-bükki-szomboly Chasm. The typical feature of the karstic plateaus is that they are treacherous as concerns the orientation in the landscape, and one can be quite easily lost there... therefore it took 2 days for us to find this Chasm finding by coincidence one of the entrances to Meteor Cave (both Chasm and Cave also listed as particular WHS). Once again, what is seen on the surface is not very spectacular, and kids were a bit disappointed by the small hole, which is actually the sinkhole to this Chasm that is one of the deepest in the entire area. We also visited eastern parts of Slovak NP - Zádielsky gorge, which is not included to this WHS but proposed as TWHS together with a dramatic lanndscape of Slovenský Ráj (Slovak Paradise) National Park - Karts Valleys of Slovakia. We could see Zadiel even from distance, and this structure is really very impresive. All in all, I liked the karstic landscape of this WHS, which is very diverse and picturesque. It deserves to be WHS. To me, the caves of Aggtelek and Slovak Karst are the best WHS we have and I'm very proud of it. Depends of course on the cave you visit, but if you had been born, let's say in Eastern Slovakia, you would have visited most of them by the time you've finished your compulsory school attendance. Summer is the best time to visit, when there's a season. 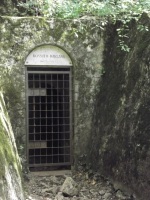 Most of the caves are closed off for winter, one or two are open. I would recommend visiting the Domica cave, either from Slovak or Hungarian part. Hungarians have it opened all year round and are much more accomodating than my compatriots are, I am sad to say. There's an underground river you can ride and you will cross border and the interior decorations are pretty. Another stunner is Dobsinska ice cave. Ochtinska Aragonite cave has beautiful decorations and colourings. If you manage to find yourself skiing in Jasna and the Demanovska Freedom cave is open, do see, it's also lovely. The cave system of the Aggtelek and Slovak Karst was inscribed mainly because of the high number of caves in a relatively small area and the variety of geological morphology, but less because of the outstanding value of the individual caves. At the time of inscription 712 caves were registered, 23 are listed in the nomination files (see above), today more than 1000 are known, and seven or eight of them are show caves and open to the public. 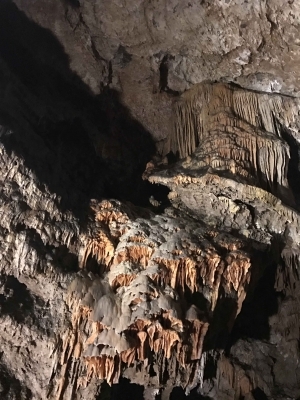 We spent one day for this WHS, we have chosen three caves that cover the diversity of the cave types: the Dobšinská Ice Cave, the Ochtinská Aragonite Cave, and the Gombasecká cave. First, we visited the Dobšinská Ice Cave. Ice caves with year-round ice formations are relatively rare, there must be sub-zero temperatures throughout the year, at least in parts of the cave. The main attractions in the Dobšinská Cave are the huge ice block that fills almost the whole first part of the cave, and the Great Hall, where the ice is up to 26 metres thick and where you can also see ice columns and ice stalagmites. I have previously visited two ice caves in Austria, the Dachstein Ice Cave (WHS Hallstatt-Dachstein) and the Werfen Eisriesenwelt (no WHS, near Salzburg). I have to admit, that I was more impressed by the ice formations in the Werfen Cave. 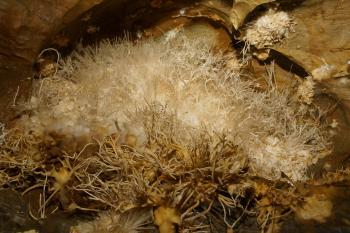 Next we went to the Ochtinská Aragonite Cave (photo), definitely the highlight of our cave tour. Aragonite is a crystalline form of calcium carbonate, a very common mineral. But in the Ochtinska Cave it creates a wonderful variety of shapes: thin needles, spirals, branched tufts, cones and a lot more. It's really unique, very different from the usual stalactites and stalagmites. The cave consists of ten small halls, the most impressive is the Milky Way Hall. 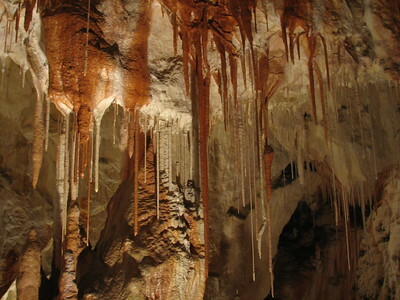 It was named after a long crack in the ceiling, decorated with milky white bundles of aragonite. We all had a stiff neck after the guided tour. The Gombasecká Cave is a dripstone cave, the special feature are the extremely thin stalactites, only a few millimetres in diameter, but sometimes up to three metres long. But there are also the usual stalactites and stalagmites. Nice to visit, but not really outstanding. Of course it is difficult to assess the value of an extensive cave system by visiting only a few caves, but I think we got a glimpse of the diversity of the site. We enjoyed our cave tour, and at least the Aragonite Cave was a unique and impressive experience. I only managed to reach four of the listed caves, three in Slovakia and one in Hungary. Dobsinska Ice Cave : similar to the Dachstein ice cave in Austria, but easier of access. Entry E6. Access by bus from Poprad-Tatry station. 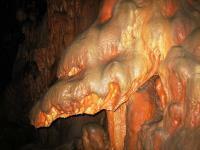 Jasovska cave : featured splendid caramel coloured rock formations. Entry E5. Access by bus from Kosice. Ochtinska cave : featured spaghetti-like stalactites. Entry E5. Access by bus from Kosice or Roznava, then 2km walk. Kossuth Cave : found the entry, but was closed. Access by bus from Aggtelek-Josvafa station. The only thing you really need to know about the Aggtelek Karst caves is that it is an absolutely fabulous place and a true masterwork of nature – just go there as soon as you can. Once you’ve seen this place you feel like you want to return again and again and discover what’s behind the next cave and the next. The beauty of the shapes, forms and sizes of the stalactites and stalagmites is mind-blowing and it’s no wonder that many poets and painters have been inspired by its bizarre shapes and colours. The caves are formed in 230 million year old Triassic limestone and about 2 million years ago, water started to get into the cracks, dissolving the limestone, widening the crevices and forming passages. Today there are over 1000 smaller and larger caves and you can visit the most spectacular ones on guided tours. I went for two tours and spent over four hours underground which was quite nice when the outside temperature was +35 and the caves holds a constant temperature of +9. Aggtelek is not only caves but also a nature area and if you want to stay around for some time I can strongly recommend the Cseppkõ Hotel, run by the nice Mr Jorge, a former Hungarian border guard who knows the town and the area inside out. I visited the Dobsinska ladova jaskyna in 2001. Since 1995 I've been in Slovakia about 30 times. If you know the ice pillars are ALWAYS there in this cave unlike other caves then it is special enough to call it a WHS. Ths has got nothing to do with politics. The entrance fee nowadays is SK 150,- which equals EUR 3,95 or old DM7,90. So 15 years down the line and taking into account inflation the entrance fee is much lower now. My opinion: it is an interesting site to visit on a nice walking distance from the railway station as well. a. “CASK does not stand out on any particular natural feature. 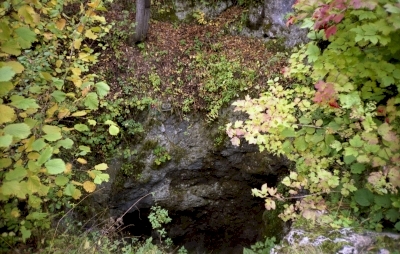 As one reviewer noted, other caves similar to those at Aggtelek exist elsewhere and, while the site is not considered unique, it is an excellent example. Although one of the better known cave areas in Europe it does not offer features in the “spectacular” category as are found in many other Karst areas”. So don’t expect too much! But don’t get me wrong – if you are in the area, have a few spare hours and quite like visiting caves then by all means visit it but this isn’t a “world class” site. Parts of it were made World Biosphere Reserves in the late 1970s and that recognition should have been enough to assist appropriate conservation. To tell the truth, experiences around the world have convinced us that too many caves are opened primarily as money-making “visitor attractions” - at least this is all state owned! Well the site certainly needed it – indeed it was perhaps surprising that Dobsinská wasn’t included from the start as it is perhaps the most “noteworthy” of the caves in the area which are open for public visiting. Despite my generally negative review of it as a WHS it does contain a sight which, as far as I can remember, we haven’t seen in any of the many other caves we have visited around the world - all year round “Ice Pillars”. One of these is portrayed in my “photo” which shows of the front page of the brochure provided back in 1991 together with the entrance ticket. Note the rather steep (for those days) 10 Deutchmarks entrance fee – the Korun was unconvertible then and foreigners had to pay in hard currency! I wonder what its entrance price is now. From "Caves of the Aggtelek Karst and Slovak Karst" to "Caves of Aggtelek Karst and Slovak Karst"
As Slovak Paradis and Dobsinska Ice Cave: Does not meet WHS criteria - Add Dobsinska to Aggtelek and Paradis to Spissky Castle? Early Pleistocene: Beginning some two million years ago, extensive and complex surface and underground erosion developed in this rock into classic forms of temperate climate karst. Natura 2000: in 2004, the Aggtelek National Park and the Slovensk´y kras National Park became part of the EU-wide network of protected the Natura 2000 sites.